Bowflex SelectTech 552 Dumbbells replace a full 15 sets of weights offering you a high-tech fitness solution that not only saves space but also increases the efficiency of your workout routine. This innovative dumbbell set features an ingenious design that allows you to change the resistance from 5 lbs all the way up to 52.5 lbs of weight with just the turn of a dial! Order the 552 Dumbbells today and Get FREE SHIPPING! SelectTech dumbbells are perfect for users who want the variety of a professional fitness club in the comfort of their own home. SelectTechs cost half the price of traditional dumbbells and take up less than 1/8 of the space – some users go so far as to display these models in their own living room. But these dumbbells are more than a conversation piece. With the Bowflex SelectTech 552 dumbbell set you have everything you need to get toned and burn fat quickly. This is the most popular SelectTech model because its space efficient design adapts so well to your home. You can switch from exercise to exercise with ease. You’ll even get a free DVD to show you how to correctly use dumbbells. What are you waiting for? Bowflex SelectTech 552 Dumbbells are backed by an exceptional 2 year warranty on all parts. The Bowflex SelectTech 552 dumbbell set is a superior product, and Bowflex stands behind each and every one. Your satisfaction is guaranteed! Just purchase your dumbbells (direct from Bowflex) and workout for up to six weeks. If you’re not 100% satisfied with the results, simply contact their customer service department for a Return Authorization, return the set (including any accessories) in its original condition and packaging to receive a full refund, less shipping & handling. Item must be received no later than 2 weeks after your return authorization is given. What more could you want? Order the Bowflex SelectTech 552 dumbbells right now and start seeing results! These weights are great. They're really simple to use and don't require much space at all. Perfect for a small home gym! I I live in a small apartment and don't have a lot of room for individual weights so these looked like just what I needed. Once I received my set I was happy to realize that I was right - these are awesome! I wish they were cheaper but they're well worth what you pay so no real complaint there. One tip, make sure to get the stand, you'll be happy that you did - trust me. These are great if you have a home gym that the whole family uses. The variety of weight settings means that everyone can use them effectively for a workout. My wife and kids love these dumbells as much as I do. f you don't have the space (or the money or that matter) for a huge set of dumbbells then the Selecttechs are just what the fitness doctor ordered. I sold my old dumbbell set after trying these for couple of weeks. They do take some getting used to as they're larger than your typical dumbbells but their functionality makes the period of adjustment very worthwhile. I wouldn't trade these for anything. I love how easy it is to adjust these for a different weight. It's fast too which I like as once I get going I don't like to slow down much. These help me stay focused on my workout. This dumbbells are just ingenious. What an idea! With a simple turn of the dial you have a vast array of different dumbbell weights at your disposal. They're amazingly simple to use, the switching mechanism works very well and they're really comfortable on top of all that. Bowflex obviously has some very bright people working for them! Highly recommended! I love the compact size of Bowflex's 552 dumbbells. It really makes them very convenient to use. I'm using them for general strength training and they work great. The design is very innovative and they're super sturdy to boot. I really can't find any flaws and would recommend them to anyone that's tired of messing with traditional dumbbells that take up way too much space. The space savings alone make the Bowflex Select Techs worth the purchase. I enjoy working out with dumbbells but I've always hated how much space they take up. 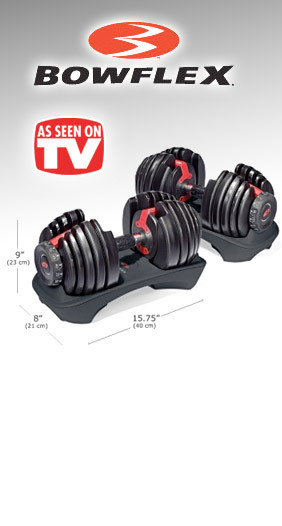 Bowflex has cleverly solved that problem with this dumbbell set. The weight switching mechanism works very well - better than I expected to be honest. The price is pretty reasonable too. If you're looking for the next evolution in dumbbells this is it.